Jeff has been a member of our team since 2014 and is a shareholder in the firm. He enjoys working closely with clients to develop straightforward solutions to complicated issues, whether it’s financial planning for business owners and professionals, or assisting nonprofit organizations and other institutions with managing their endowments. Jeff graduated from Colgate University with a degree in mathematical economics and obtained his law degree from Georgetown University. 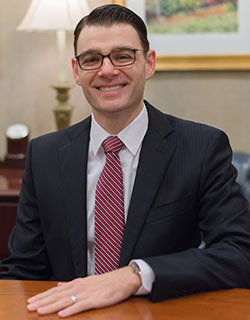 Prior to joining Kooman & Associates, he spent seven years as a tax attorney with the Sutherland law firm in Washington, D.C., where he focused on defending individuals and corporate clients in proceedings with the IRS and state taxing authorities. In addition to being a Certified Financial Planner™ professional, Jeff is a General Securities Registered Representative (Series 7) and is a Registered Investment Advisor Representative (Series 66) in 27 states. He also holds various health and life insurance licenses. Jeff lives in Hollidaysburg with his wife, Kate, and is actively involved in the community. He is a member of the Blair County Chamber of Commerce public policy committee, the Bedford County Chamber of Commerce governmental affairs committee, Altoona Sunrise Rotary, and the Pennsylvania Bar Association. He is also a graduate of the Leadership Blair County program. In his free time, Jeff is an avid golfer and enjoys spending time outdoors. Raymond James does not provide legal services.